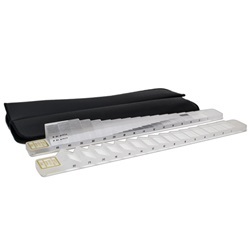 This prism bar set includes both a vertical and horizontal prism bars. The vertical prism bar has 1, 2, 3, 4, 5, 6, 8, 10, 12, 14, 16, 18, 20, 25, and 30 diopters. The Horizontal prism bar has 1, 2, 4, 6, 8, 10, 12, 14, 16, 18, 20, 25, 30, 35, 40 and 45 diopters. Comes with dual sleeve leather case. Manufactured by Bernell. Comes as 1 set.